Let’s cut right to the chase: Barry’s deepest affections go to one genus, Helleborus. And hellebores, as they are commonly called, were everywhere. (The plants are also called Christmas rose or Lenten rose although the blossoms do not really resemble roses and the plants do not necessarily bloom at Christmas or Lent.) 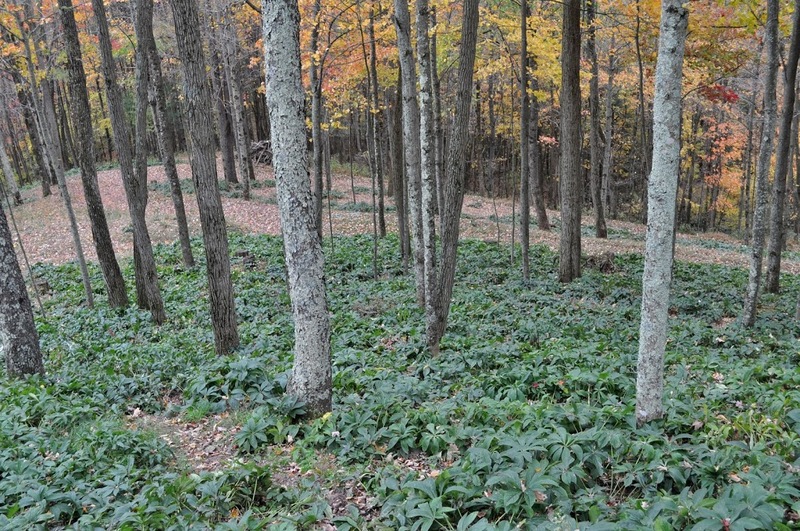 Steep slopes beneath towering maples and oaks were blanketed with verdant carpets of thousands of hellebore plants. 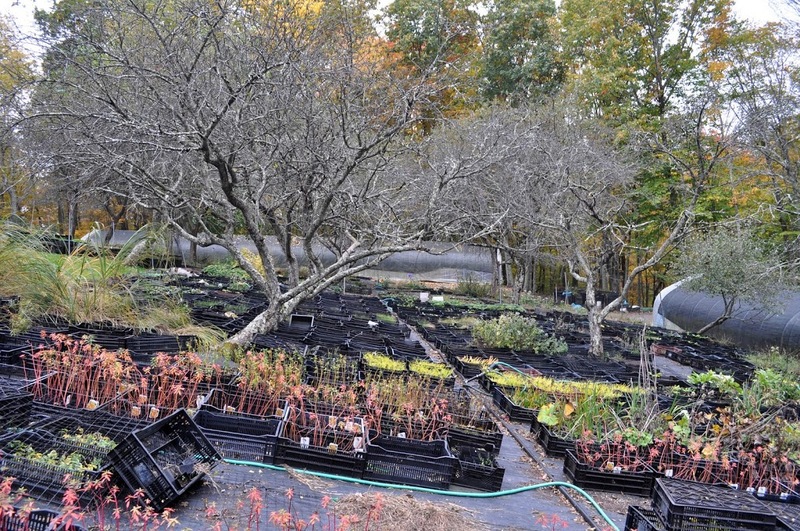 Many of these plants were seed plants for Barry’s breeding program. In addition to selling thousands of hellebores, Barry also has developed some new varieties. We can’t just leave hellebores hanging a few paragraphs back. I also am a big fan of most of this genus, and am the proud grower, for 8 years now, of some of Barry’s creations. One asset of hellebores, mentioned previously, is their verdant foliage; I didn’t mention, though, that the leaves stay green all winter. This far north, I value anything green in our mostly achromatic winter landscape. Another plus for this genus is that deer leave the plants alone. And that the plants thrive in partial shade. And that they self-sow to make new seedlings as well as spread vegetatively. They do so with enough restraint to never become a bother or, worse, invasive. While the flowers do not look like rose blossoms, they are beautiful, in colors from white to white suffused with purple to purple, and sometimes pale green.Wait, that’s not all! The flowers start blooming very early in spring, typically in March in my garden, and then continue to bloom for weeks and weeks. 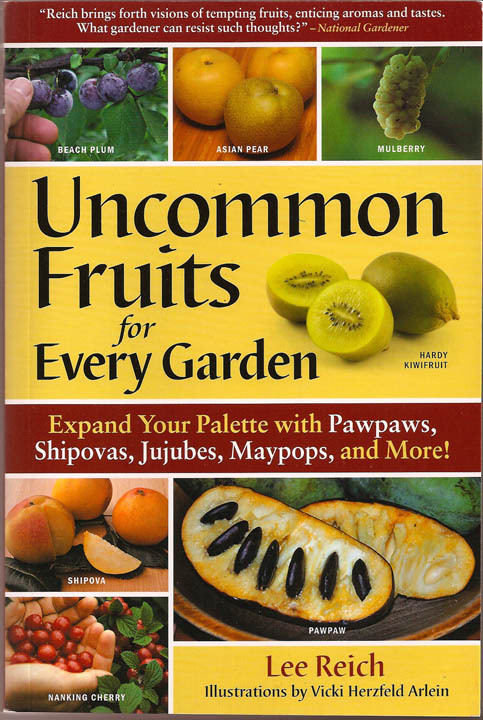 One of my lecture topics at the master gardener conference was “Landscaping with Fruit,” and one of the premier dual-purpose plants that I touted was pawpaw (Asimina triloba). The tree has a neat, pyramidal form and all season long sports large, lush, healthy green leaves that lend a tropical air to the landscape. It’s a tree that you can plant (plant two, for cross-pollination), give some care to get it growing, and then year after year harvest fruit without giving a second thought to pests or pruning. Even deer usually leave mature trees alone. In addition to those lush leaves, pawpaw has other tropical aspirations. It is the northernmost member of the mostly tropical custard apple family. Each flower is a multiple ovary so can yield a cluster of up to nine fruits, similar to clusters of bananas except that pawpaws are shaped like and about the size of mangoes. Most tropical is the flesh itself of this cold-hardy, native fruit. 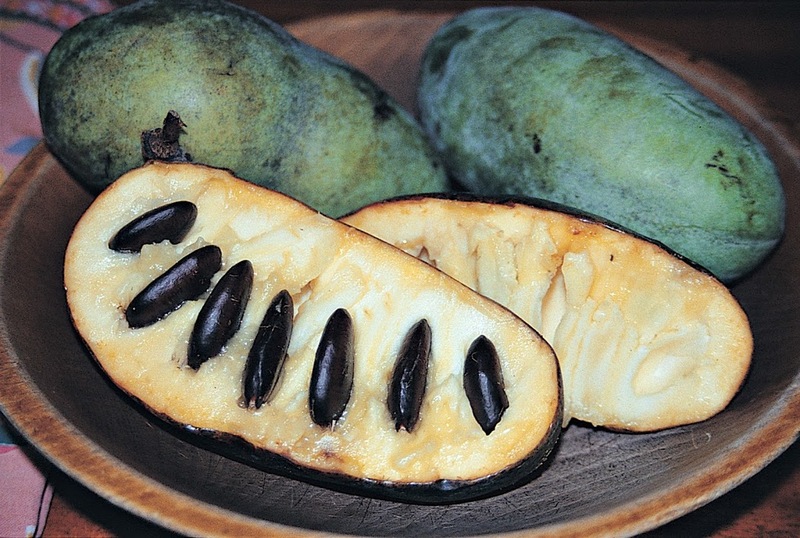 Pawpaw flesh is creamy and yellow, like banana. What’s more, it has flavor that also is similar to banana along with some mango, pineapple, and avocado mixed in; or vanilla custard; or creme brulee. Pawpaw trees shed their tropical aspirations in autumn, about now, when the leaves turn a clear, bright yellow and then drop. That’s also when the fruit ripens; I’m presently inundated with this easy-to-grow “tropical” fruit. You definitely can grow pawpaws in the New Paltz area, and further north. 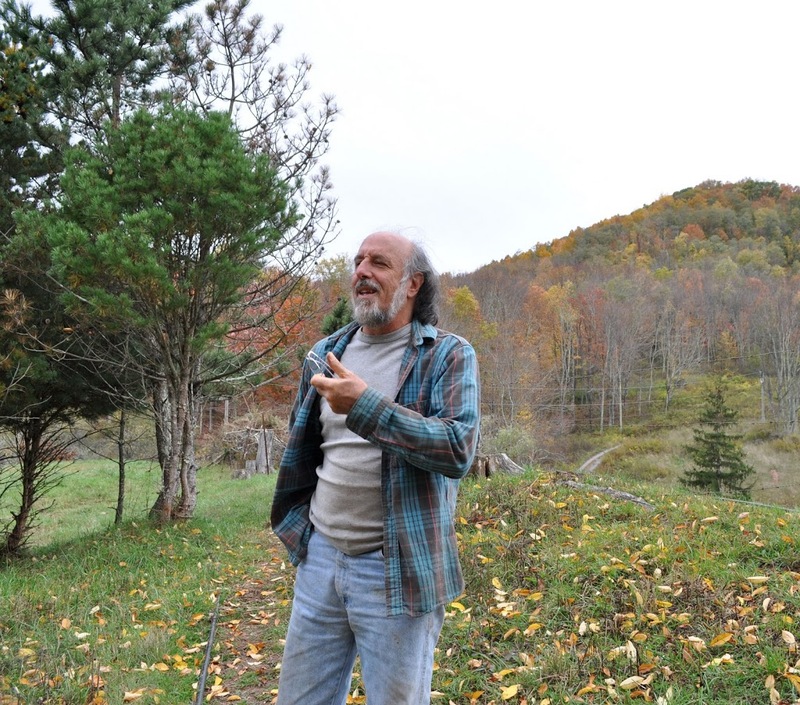 I’ve grown and fruited them here in New Paltz for many, many years. Finding some to taste is more problematic. But . . . I may have a fall fruit workshop and tasting — with pawpaws and some other fruits — this year within the next few weeks. Let me know if you’d like to be on my email notification list for that workshop and other events. That would be great! I have just found your website and am enjoying it very much and learnning a lot! I’d love to get on your mailing list for pawpaw (and other!) workshops. Thanks. Several hundred?!! Any plans for what to do with all the fruit?